It has been a quiet week due to the Christmas festivities and Katherine having tonsilitis - get well soon Katherine! We have received 5 squares this week! Many thanks to all those who stitched them! This week, Katherine has been working on Lillie-Mae's quilt and is almost finished - just the binding to go! This quilt is quite a milestone for LoveQuiltsUK as it will be our 50th! Four have been done by Gaynor and one by Finley - the other forty-five have been done entirely by Katherine - big congrats to Katherine and I'm sure I speak on behalf of us all when I thank her for her immense commitment and contribution to LoveQuiltsUK. Well done. After Christmas, Katherine will be working on an emergency quilt for Corey-Jack which will be constructed from Any child squares. Poppy's quilt was opened (Pink theme). Jack B's quilt was closed. We have received 5 squares this week! Many thanks to those who stitched them! It only remains for us to wish all you wonderful LoveQuiltsUK stitchers a wonderful Christmas! A happy and peaceful Christmas to you all! We will be holding Amber-Rose, Lillie-Mae and Abigail's quilts for posting in the New Year, due to heavy snow conditions and the reported huge backlog within the Royal Mail. 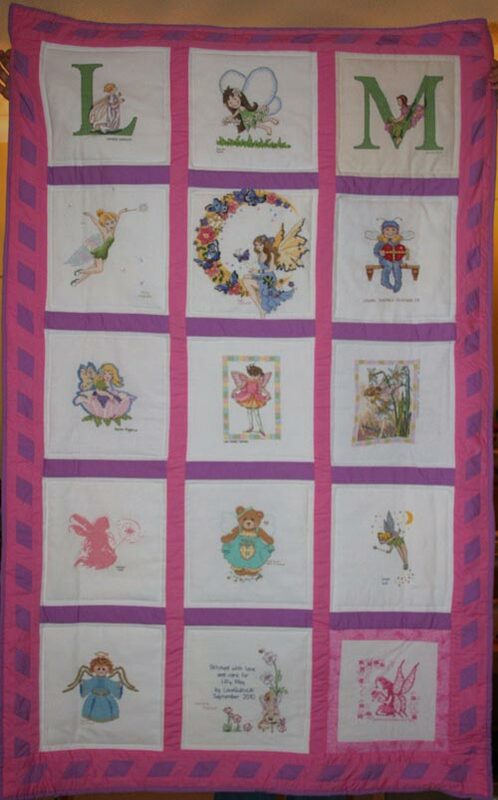 Also this week, Lilly-May's quilt was received! Well done to all the stitchers, and to Katherine for quilting it all together! The deadline for Krystal S (Princesses), Lennon Georgie (Noah's ark) and Elizabeth's squares have now passsed. There are still quite a few squares outstanding. If you are unable to complete your square, please could you let us know. If not, please could you send them by the first week of January at the latest as Katherine will need to make a start on the quilts then. Many thanks. We would also like to thank the two ladies who have sent generous cash donations this week - you know who you are. It's very much appreciated. Hope you are all ready for Christmas!